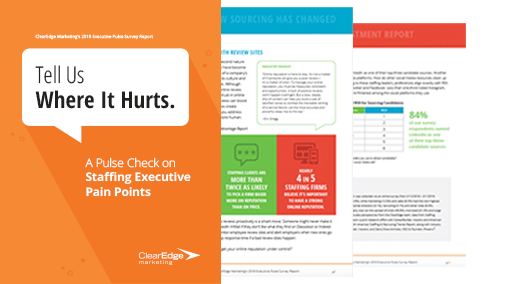 ClearEdge Marketing’s 2018 Executive Pulse Survey Report reveals not only how staffing businesses deal with pain points, but how those points have changed over the past two years. The report also reveals hints about where the brightest leaders see the industry headed, how they’re positioning their businesses to ride the next wave into the future of staffing — and where you should take your marketing strategies to get the most out of your marketing investments. How do you stack up? Use this as one more piece of benchmarking data as you plan for the future. Tell us where you stand and share how you’re turning pain into power this year by reaching out to your favorite ClearEdge team member or write us at info@clearedgemarketing.com.